Our helical-bevel servo gear units are reliable, durable and low-maintenance. They provide the ideal basis for a wide variety of servo drive solutions. These servo gear units are especially flexible with regard to motor mounting options. 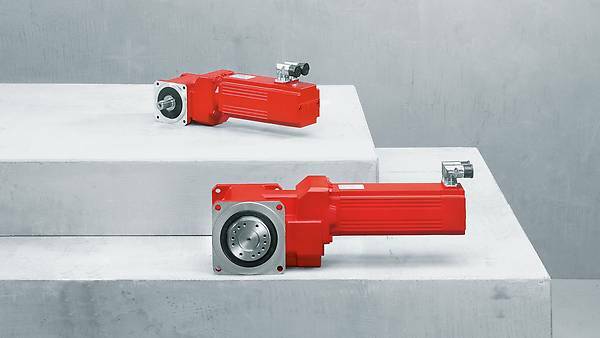 Low-backlash helical-bevel servo gear units of the BS.F series – versatile and compact! Servo gear units that are remarkable for their wide range of variants and compact design – our low-backlash helical-bevel servo gear units of the BS.F series! They are available in six sizes and five output variants, providing you with countless possibilities. The BS.F helical-bevel servo gear units ensure low rotational clearance, even for the standard designs. You also have the option of reducing the rotational clearance further. Rotational clearance will remain consistently low for the entire servo gear unit service life due to the wear-free operating performance and high-endurance design of the running gears. The versatility of these units extends beyond the technical characteristics to the large number of motor mounting options made possible by the EBH motor adapter. The helical-bevel servo gear units are designed for nominal torques of 40 Nm to 1220 Nm. The permitted acceleration torque ratings are significantly higher than these values. The units are also remarkable for their high permissible overhung loads, which vary between 2600 N and 36 000 N, depending on the size and gear ratio. Only half the solution without a motor? Then take advantage of our modular concept and combine the servo gear units of the BS.F series with the dynamic servomotor of your choice. thanks to the helical gear input stage combined with a hypoid output stage. with the B5 mounting flange that optimally integrates the drive unit into every application.